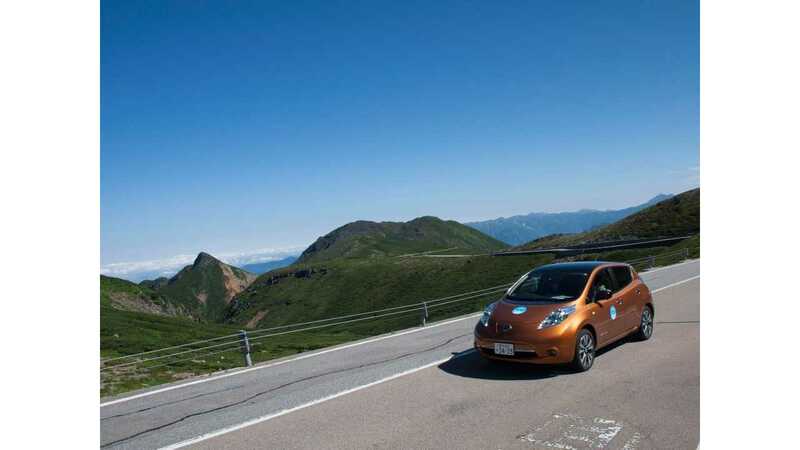 Nissan recently visited the Japanese Alps with a zero emission fleet of LEAFs. 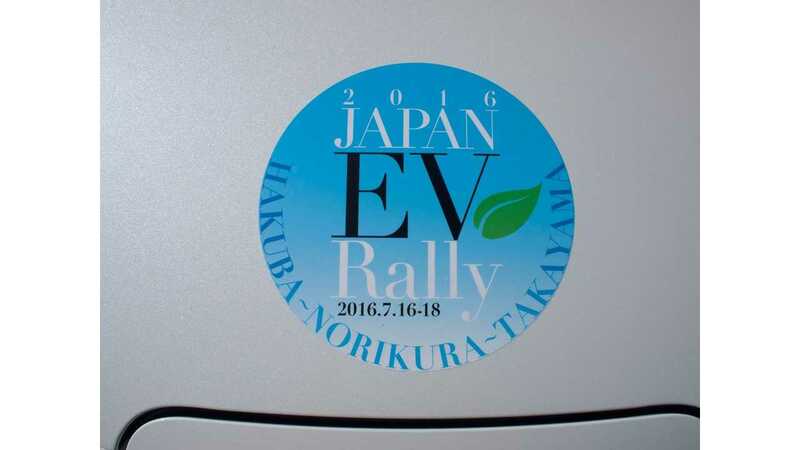 In total, six LEAFs participated in the Norikura Skyline Special Stage at Japan EV Rally 2016. 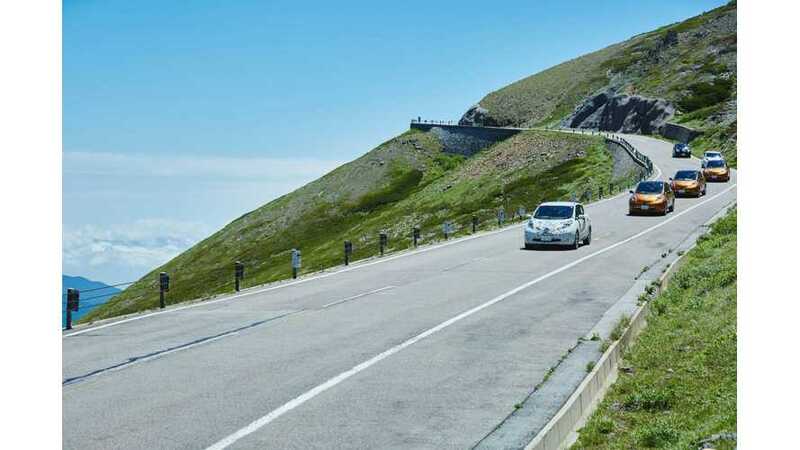 One of the pretty swell advantages of all-electric cars is that you doesn't lose power due to high altitude hill climbing, and also that regenerative braking enables getting a jump on recharging those batteries on the return. Hill climbing above the clouds. EVs only. 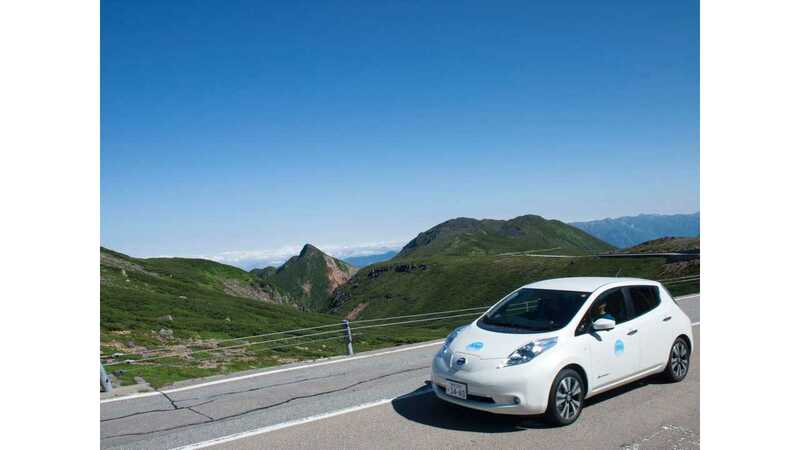 ...Japan's largest EV festival, JAPAN EV RALLY 2016, Hakuba-Norikura-Takayama, took place at one of the world's most beautiful mountain ranges. The host city, Takayama in Gifu Prefecture, is celebrating the 80th anniversary of its city government's inauguration and to commemorate the occasion, on the final day of the festival, two local organizations (the Japan EV Rally in Norikura and EV•PHEV test drive in Takayama Executive Committee) conducted the Norikura Skyline Special Stage, an extraordinary hill climb involving 24 EVs on a normally restricted mountain road. Six LEAFs provided by Nissan were among the entrants, which had received special permission to ascend the Norikura Skyline and summit at Mt. Norikura Tatamidaira (altitude 2702 m). Covered under Japan's my car control regulations* this road is closed to private vehicles due to environmental concerns. But thanks to the fact that EVs do not produce harmful CO2 emissions, special permission was granted to enter the area for this special stage of the rally. Through the comments of journalists and rally-related event participants, this newsletter looks at the promise of EVs and their growing role in the world from a different perspective. Like the Norikura Skyline in Takayama, many popular tourist areas (Zermatt in the Swiss Alps is another example) around the world restrict private road traffic. Increasingly it is the case that the only private vehicles allowed on the roads are EVs. At 2702 meters, the Norikura Skyline ascends to the highest altitude of any road in Japan. For the Norikura Skyline Special Stage, only Nissan LEAFs and other EVs and FCVs registered to corporations were permitted to participate. Behind the steering wheels were several journalists and members of the organizing team. 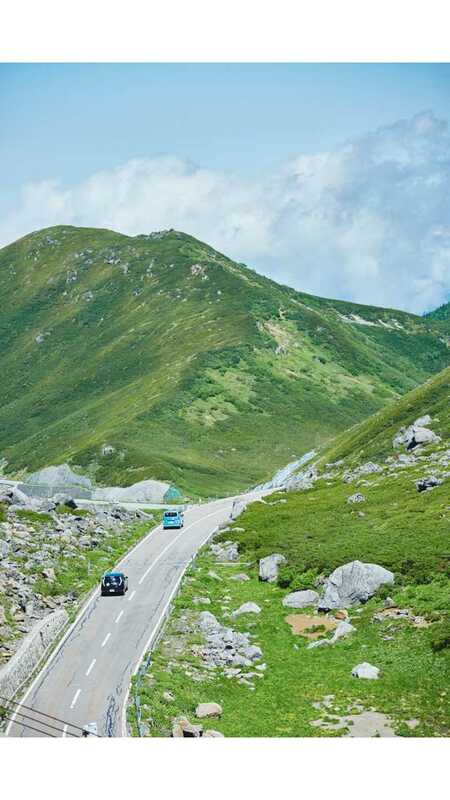 Ascending the mountain in cars that are both whisper-quiet and powerful enough climb effortlessly afforded the drivers panoramic views from one of the most magical areas of the Japanese Alps. Looking ahead, we can envision the possibility that zero-emission EVs may initiate further change in driving regulations, opening the door to new driving experiences for more people. "It felt great. A truly exciting experience." "Even in ECO mode climbing was a breeze. Going downhill regenerative braking meant that I didn't have to worry about the amount of battery power remaining." "Just using the accelerator gave me enough control so driving was stress-free. The low center of gravity made the car easy to handle." "When overtaking cyclists I didn't feel guilty. Now I know firsthand how zero emissions feels." "When I opened the window I could hear birds singing. I've never had a driving experience like this before." "Even at 2,000 m, power output felt strong and smooth. This is unique to EVs." "If I had been on a tourist bus I would definitely have felt car sick. This led me to think that this was my only chance to reach this peak." "Above 2,200 meters the vegetation changes and the scenery turns to alpine mountains." "While I felt relaxed driving, I could still enjoy the changing scenery." Sustainable cars protect human life as well as the environment. Norikura is very beautiful. I was delighted we were blessed with great weather. Even as we go about our daily lives, we must protect nature. This is important. Unless we protect both nature and ourselves, human beings cannot survive. The Norikura Skyline Special Stage, which involved sustainable cars, is just the kind of event that proves we can undertake great pursuits of the human spirit and protect nature at the same time. What surprised me most at the summit was how little water was there. There's no doubt in my mind that this is the result of drought due to climate change. Without measures to stop global warming, trees will die and the vegetation will change. It is said that by 2090 the forests here in Hida will have disappeared. I think it's important that we find ways to increase the use of EVs and PHEVs more and more. In addition to Norikura Skyline, and Fuji Azami Line are two other areas where my car control limits road access to EVs. This approach is starting to gain traction around Japan. Given Japan's declining birthrate and people's shift away from personal driving, tourism is one of the bright areas for individual car use. I hope car manufacturers will take the lead in promoting the use of cars for tourism, highlighting environmental issues and the importance of regulations that protect nature.